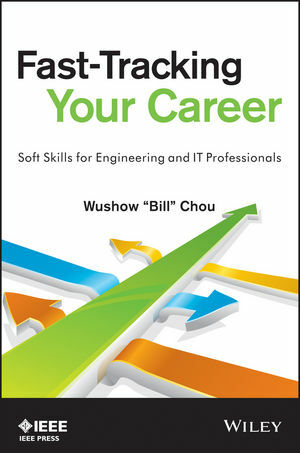 Fast-Tracking Your Career provides engineers and IT professionals with a complete set of soft skills they can use to become more effective on the job and gain recognition from management and colleagues. The 11 core skills covered here are accompanied by more than 40 detailed guidelines on how to master those skills. The book offers first-rate advice on how to go about acquiring communication skills, people skills, presentation skills, time management skills, and others. Specific examples about current situations are discussed, exploring the impact of the Facebook phenomenon and the subprime mortgage crisis. Dr. WUSHOW "BILL" CHOU was Deputy Assistant Secretary and the founding CIO of the U.S. Treasury where he oversaw fourteen bureau CIOs and an annual budget of two billion dollars. He was also the founding Vice President of Telecommunications for Network Analysis Corporation; founding Director of Computer Studies at North Carolina State University; founding editor in chief of one journal and one magazine; and consultant to more than thirty organizations (both government and private sector). He is a Professor Emeritus at North Carolina State University and Chair of the Advisory Board of IT Professional magazine. Dr. Chou is a Fellow of the IEEE.